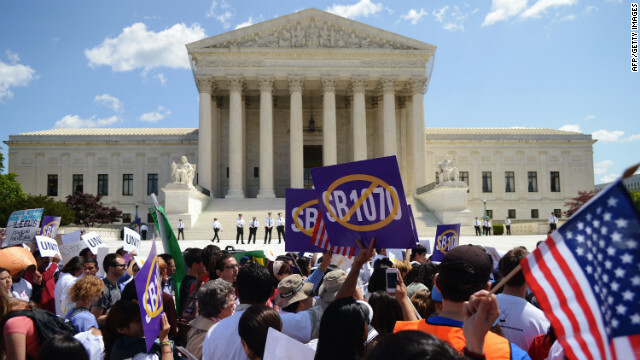 Protesters shout slogans during a protest against Arizona's immigration law outside of the U.S. Supreme Court in April. (CNN) - A federal judge is once again weighing arguments over the "show me your papers" provision in Arizona's controversial immigration law. The provision was the only one of four major parts of the law upheld by the U.S. Supreme Court in June. But opponents argued in U.S. District Court on Tuesday that new evidence shows that a federal judge should block enforcement of the provision. "It is infected with racial discrimination," attorney Karen Tumlin of the National Immigration Law Center said outside the courthouse Tuesday, according to CNN affiliate KPHO. Attorney John Bouma, representing Arizona, argued that the law does not discriminate. "You just can't say that Latinos are going to be primarily impacted and that's discriminatory," he told CNN.